You know what the problem is with typing up blog posts when you are rushed and tired? You forget some totally important things. For example, I was exhausted when I finished up my review of Herbivoracious. So exhausted, in fact, that I forgot to post the whole big teaser I had planned. What I meant to write was that you should note the recipe closely because I have another awesome recipe coming up that is based on that one. Here’s how it happened. Those savory quinoa cakes were delicious right out of the frying pan, but once they were cool they needed a little something. I dipped them in some tomato sauce, then the flash of brilliance struck. Pizza. On my quinoa cakes. You might think I am overstating this when I say that it was life changing, but I am not, honestly. Here’s the thing- pizza is unhealthy, right? Well not anymore! It’s healthy, it’s gluten free, its easy, its just so delicious. My sister and I finished the mini pizzas that I had made right away. Then my sister looked at me and said “you’re going to make more immediately so you can photograph them, aren’t you?” Well, at least she knows me well, right? Anyway, I don’t really have much to say, other than make these. Now. Adapted from these Savory Quinoa Cakes from Herbivoracious. Combine the quinoa, eggs and spices in a bowl and stir to combine. Add a bit of oil to the pan, then form patties and fry until golden brown on both sides. Note: At this point, the patties can be refrigerated for until you are ready to finish the pizzas. Line a baking sheet with parchment paper, and place the patties on the sheet. 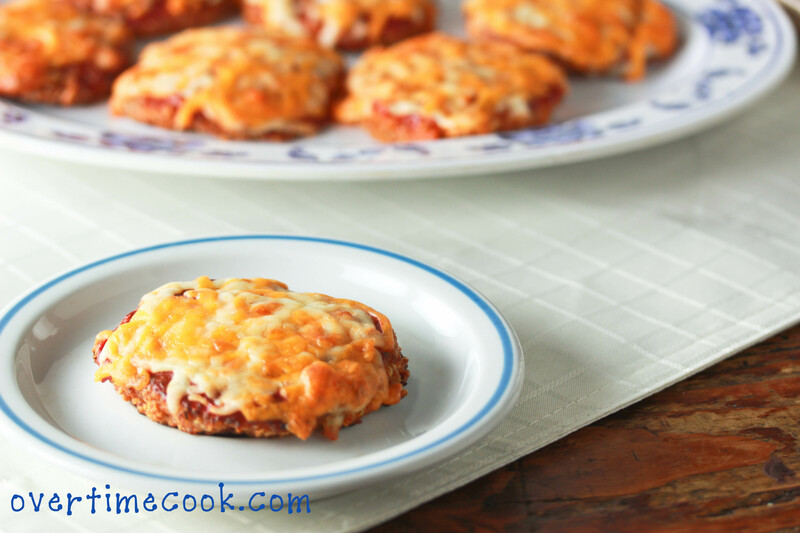 Spread a small amount of tomato sauce on each patty, then top with shredded cheese. Use more or less cheese, depending on how cheesy you like your pizza. Bake at 350 for 10-15 minutes, depending on how dark you like your pizzas. Oh yes these are sure fabulous! I think all the kids will love it, thank you for this wonderful idea! I think my favorite recipes on your blog are the ones you’ve tasted and would eat regularly. Love those times when the idea comes in a flash and then actually works! Looks Yum. The pictures are fantastic! 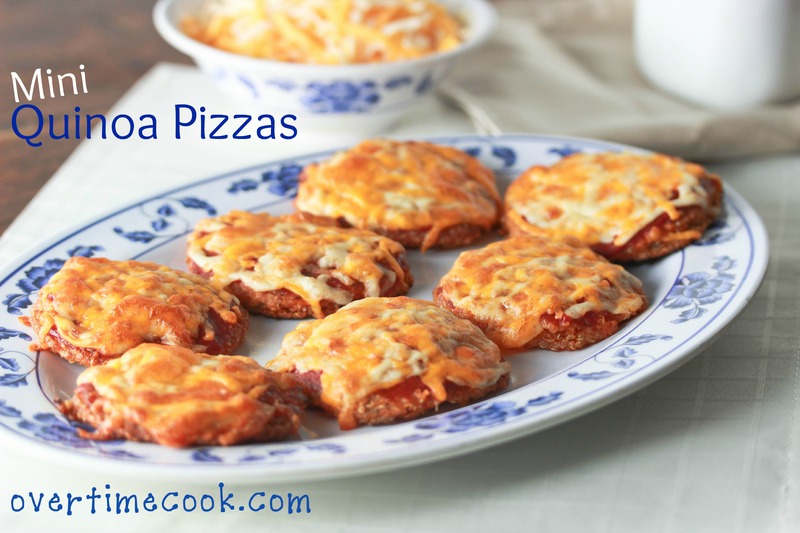 Not only will adults enjoy these little pizzas but they would make a great lunch for the little ones too. By the way, you certainly don’t need any blog teasers. People always return to read your posts. Such a good idea! They look Devine. Thanks for sharing. 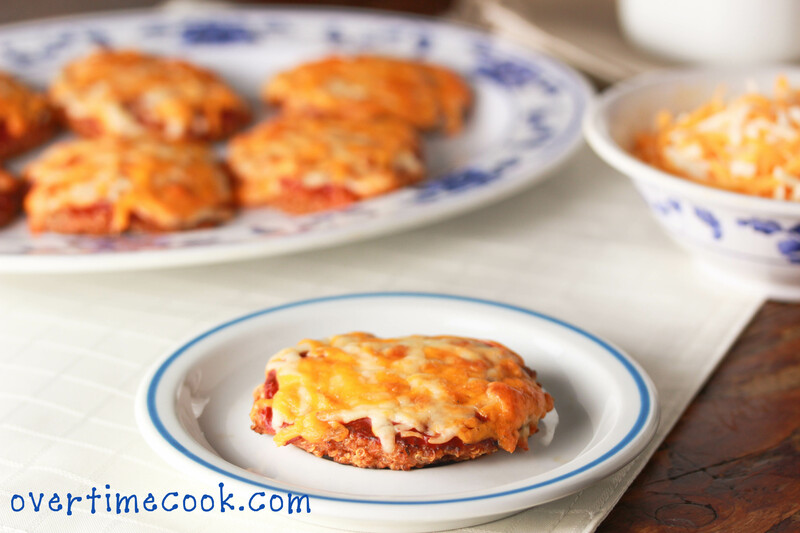 This remind me of an adult version of the English muffin pizzas I used to make as a kid! What a great idea and they sound fantastic! How fun. They remind me of using cauliflower for the pizza crust. Must try. Love it! I’ve been looking for a low/no-carb pizza crust. Think there’s any way to do this without the mini/patty thing? To simplify and cut down on the prep? Because the only thing I want more than healthy is healthy AND easy. Also, can you elaborate on about how big and thick to make the patties? Made this for supper tonight and it was EXTREMELY well received, haven’t had such a happy family in a while! Even the slightly picky baby kept asking for more, I couldn’t believe how much she put down! Made this for lunch today – absolutely delicious! Do you think egg whites could be used in place of eggs? i tried with egg whites, completely fell apart and didn’t stick at all. Hey! I once made your chickpea burgers and melted cheese on them – also super yum! Can’t wait to have a go at these. do you think you could bake the patties instead of frying? would they still stay together? I haven’t tried it, so I can’t say for sure. If you want to try it, start with 2 or three and see how it goes, then bake the rest if it works. Don’t forget to let me know! I tried making these and i could form the quinoa mixture into patties… I tried frying them and they just fell apart! any tips? Amazing quinoa pizza!!!! Really enjoyed!!! we baked them instead of frying was absolutely perfect! My daughter made these tonight. She baked them first in a muffin tin for 15 minutes on 350. She added marinara sauce & cheese and baked again for 7 minutes. AMAZING!!! Awesome – thanks for the feedback! I am sure others will find this very useful! How much raw quinoa do I need to get 2 cups of cooked quinoa?